Roll a pancake. Draw the sun. From Amazon: Llama Llama is learning lots of new things at school and making many friends. But when Gilroy Goat starts teasing him and some of their classmates, Llama Llama isn’t sure what to do. And then he remembers what his teacher told him—walk away and tell someone. It works! But then Llama Llama feels badly. Can he and Gilroy try to be friends again? Great read-aloud…all of Anna Dewdney’s books are! Rhyming wordplay…young children love to rhyme and rhyming is a great literacy tool. Young children need lots of time with sensory activities. Playing with clay is one of the best. You can make your own (there are many recipes available online and there are several in my Show Me How book) or use store-bought play dough or clay. Rolling, patting, pressing, coiling – what fun! You will need: Clay (either homemade or store-bought), surface to work on (I love the thin vinyl cutting mats that stores usually sell in 2 or 3 packs…one side is smooth and the other has a bit of texture that helps to keep it from sliding on the table), blunt implements to create interesting patterns (spoon, jar lid, old credit card). Your child will love to just play with the clay…probably pulling off small pieces…that can be a game in itself…have a small plastic bowl or cup for her to drop the little pieces in. You can count them or put them in groups of 2 or 3. I recommend one color at a time (or no color if you are using homemade clay and you haven’t put food coloring in)…otherwise you may have rainbow clay (which is pretty cool also!). If you want to play at making shapes, you and your child can roll little balls, big balls, cylinders, snake shapes. Once you’ve made shapes, you can combine them to make animals or snowmen or people or whatever your child’s imagination creates. Don’t forget – click this link: http://eepurl.com/8pglH and grab the free Anti-Bullying Toolkit Guide for Kids. You’ll also get the first issue of my quarterly newsletter (with picture book recommendations, quick and easy craft projects and simple healthful child-friendly recipes all tied in to a seasonal theme…plus tips for parents and teachers), Picture Books Help Kids Soar, when it comes out this winter. 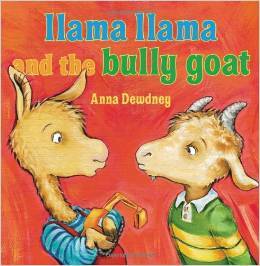 This entry was posted in Bullying, Craft projects for kids, Llama and the Bully Goat, Perfect Picture Book Friday and tagged Anna Dewdney, Bullying, How to Make Clay Animals by viviankirkfield. Bookmark the permalink. Cute story. Teasing/bullying shouldn’t be tolerated, but I hope Llama works it out with other kids. Llama Llama is so well drawn, you want to love him before you know ‘im! Great series! A lovely activity to go with the story Vivian. Llama Llama is always a fun read!! This book looks wonderful for two reasons: I love rhyming books and this book deals with bullying, I’ll have to check it out. Your “Anti-Bullying Toolkit Guide for Kids’ sounds too good to resist. I like how the subject of bullying is handled. I’m adding this one to my list. I read this awhile ago and really like how Llama solves the problem. Great clay animal activity! We really like the Llama Llama books too. Love the clay animal craft too. I absolutely love these illustrations and, from what you’ve shared, the text sounds fabulous too! Thanks so much for sharing this at Booknificent Thursday this week! Happy Thanksgiving!